What Is Still Needed On The Dodgers’ Depth Chart? As of today, the Dodgers have not made any big improvements this off-season. But even so, as I look at their depth chart, they have enough assets to open the season. There still are improvements that need to be made (i.e. right-handed catcher and right-fielder), but overall, Andrew Friedman’s philosophy of depth has worked. As I look at the Dodgers’ depth chart, which can be found here, there are really only three remaining holes. You’re probably tired of hearing about this, but I’m going to keep talking about these needs until they’re taken care of. As I look at the depth chart, the first gaping hole I see is at catcher. Yes, the Dodgers traded for Russel Martin this weekend, but neither Martin nor Austin Barnes are reliable every-day starters. And, as always, J.T. Realmuto is still on the trade market. A trade involving Realmuto still makes a lot of sense for both teams. The Marlins are at least four years away from being ready to contend and Realmuto has only 2 years left before he reaches free-agency. With this in mind, the Marlins have realized that their best option is to trade him while he’s at maximum value. The holdup here is in the differing opinions of what Realmuto’s worth. The Marlins are still asking for Alex Verdugo, the Dodgers’ #1 prospect and 32nd overall in according to MLB Pipeline. The Dodgers, however, are still holding on to Verdugo with white knuckles. Moving on from catcher, the next problematic position I’m finding is at second base. Chris Taylor and Kiké Hernández are both currently listed under second base, shortstop, and the outfield. Although both of them are good players, their defense is much better in the outfield. But with most second basemen off the free-agent market now, it seems like these two will be splitting time between the outfield, second base, and wherever else they’re needed. Finally, the third spot that needs improvement on the Dodgers’ depth chart is right field. Now that the Dodgers traded away Yasiel Puig, they are in need of a right-handed hitter who is comfortable in right field. This is where A.J. Pollock comes in. Pollock has been overlooked so far this offseason, due to the fact that Bryce Harper and Manny Machado are unsigned, but it appears that they will be signing soon, which should heat up the Pollock market. Overall, the Dodgers depth chart doesn’t seem quite as bad as I thought before writing this. 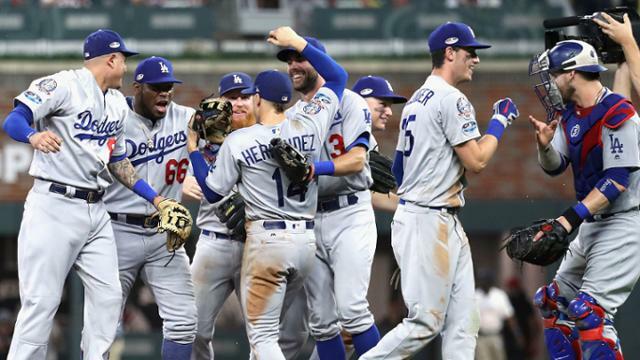 Sure, they are still some places that need improvement, but at the same time, the Dodgers do have a way of getting it done, even when it doesn’t make sense.